The Korean-German Chamber of Commerce and Industry welcomed 117 new trainees for the Ausbildung program this year with participating German automotive companies, BMW Group Korea, Daimler Trucks Korea, MAN Truck & Bus Korea and Mercedes-Benz Korea. Ausbildung is a German dual vocational training program comprising 70 percent of job training in the actual field and 30 percent of corresponding theoretical instruction provided by a university. The program was introduced in Korea in September 2017 with around 90 trainees. This year, the second generation of Ausbildung trainees will start their three years of training to become auto-mechatronics at authorized dealerships of participating German automotive companies from September. 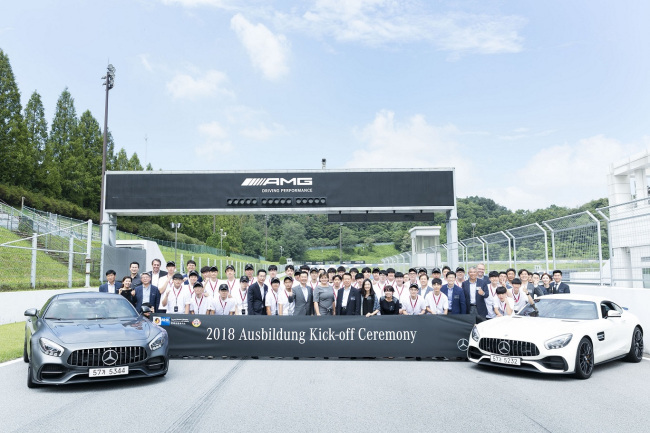 The program had previously focused on passenger car brands only, but has been expanded to commercial vehicle brands with the participation of Daimler Trucks Korea and MAN Trucks & Bus Korea.